If you have your phone running almost every minute of every day, most likely your most important accessory is a power bank. These are the devices that plug into the charging port of your phone to replenish the handset's battery. These days, you can find banks offering as much as 35000mAh of battery capacity inside, allowing your phone to run for many additional hours. Samsung currently has a deal on its 10000mAh Samsung Portable Battery that works with most smartphones. Normally priced at $34.99, you can pick up this bank for only $15.99. If you don't have an abacus handy, we can tell you that this amounts to a $19 or 54% savings. The unit is available in Silver and Pink, and comes with a micro USB cord to charge the internal batteries. With most phones, you'll be able to use the product to fully charge up two to three times. 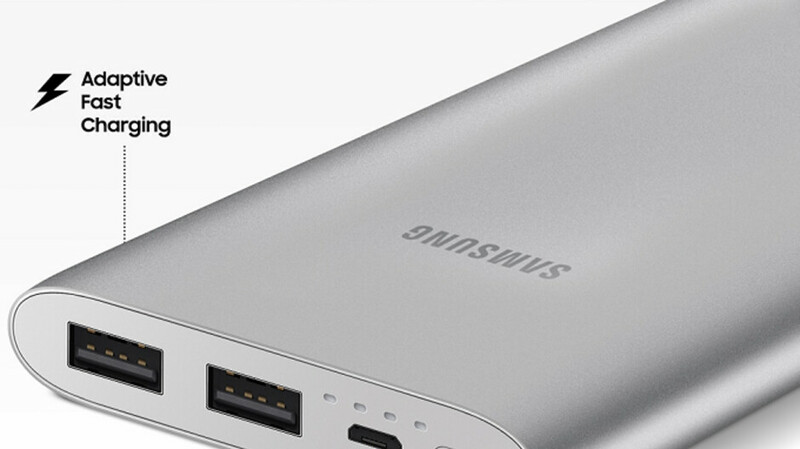 The power bank is compatible with Samsung Fast Charge and Quick Charge 2.0. And you can even use this power bank to charge up two devices at the same time, although you will lose the ability to use Fast Charge or Quick Charge when powering up multiple handsets. The Samsung Portable Battery also is equipped with Overcurrent and Over Voltage Protection to protect the device(s) it is charging. Samsung is offering free shipping, and orders will start to be sent out starting next Tuesday, January 22nd. Since the end of CY2017, Xiaomi has been selling a 10000mAh portable battery with USB-C and USB-A connectors, plus support of QC3.0 and fast-charging etc. It uses the high-uality semiconductor components from TI inside. Standard pricing, including tax, is only at US$23. This Samsung battery is a much inferior product and relatively too expensive! With such restrictive product, it is no wonder Samsung is loosing market share in smartphones! I wonder what Apple tax would charge if they made a battery bank? $149? $99?